90 Degree Slotted Coupler. Made from Zinc Plated Corrosion Resistant Steel. 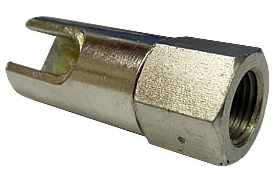 90 degree slotted coupler is used to lubricate grease fittings in tight locations and eliminates the need to replace straight fittings with right-angled designs. Often refereed to as a right angle grease coupler.